WIN! A retro Everton shirt from your era of choice! Latchford 1978. Sharp 1987. Ferguson 1995. There are players we remember all our lives. And there are football shirts that will forever hold those memories. Weâ€™ve teamed up with Campo Retro, who do retro football with a difference. They connect with fans to find ideal nostalgic shirts inspired by moments, influenced by icons, born from a love of the beautiful game. 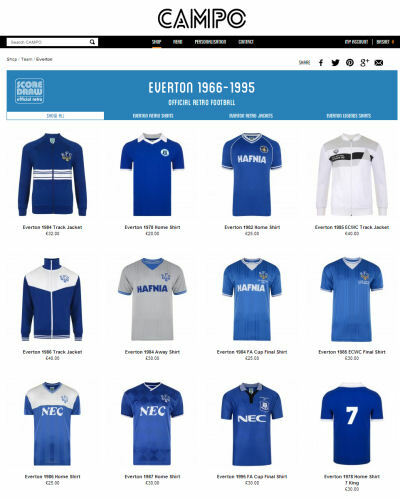 Campo Retro have a range of Everton retro shirts available, ranging from 1966-1995. And whatâ€™s more, theyâ€™ll print any name and number you want on the shirt from your memorable era. Weâ€™re delighted to bring you the opportunity to win a retro Everton shirt of your choice with the player from the history of the club of your choice on the back. You could even have your favourite player from one era in a Everton shirt from another era! Take a look at the different Everton shirts Campo Retro have to offer, choose one, then tell us and Campo Retro which shirt you would choose using the form below! WeÂ´ll then select a winner at random to win their shirt! The closing date for entries is Wednesday, 6th November 2013. Good luck! Please note. Your entrant will go direct to Campo Retro, who may use your email for promotional purposes.